I ran the City to Surf marathon on August 28th which meant in the lead up to race day I didn’t have much opportunity to eat out. The mission was all about staying home and filling myself to the brim with all things carbs. It was pretty fun J Why the night before the race I had a big serve of spaghetti bolognaise and garlic bread, then vanilla ice cream with ice magic. What a night it was! And the race all went well but that’s not what I’m writing about on this occasion…. But believe you me I could wax lyrical about the race for a good long while! What a day it was! Anyways though, to celebrate making it through I booked a dinner in for GG and I on the Thursday after the race. This was with thanks to a jumponit voucher. 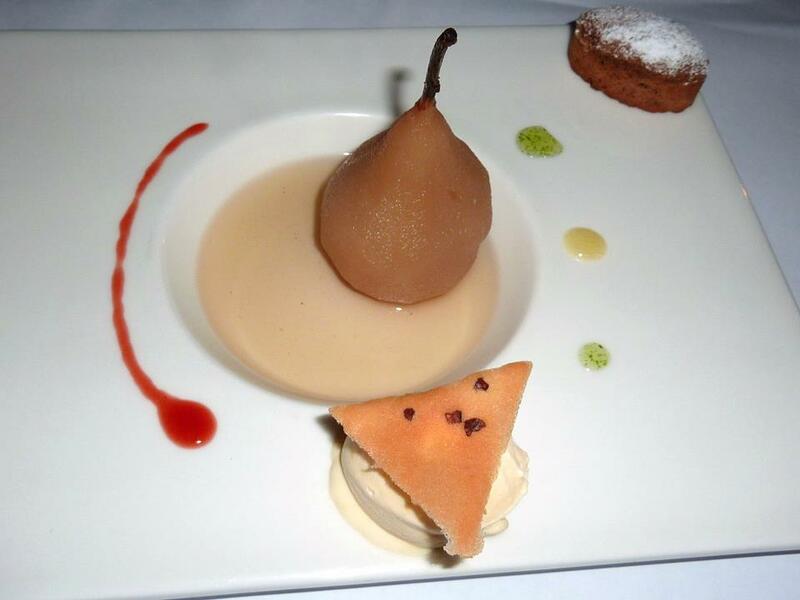 This was the opportunity to “Frolic with French flavours over a romantic three-course dinner and a bottle of red or white wine for two for only $89 at Bouchon Bistro”. I hadn’t been to Bouchon Bistro before but given that Wembley was relatively close to home and I don’t mind French food I was keen to give it a go. So we headed along last Thursday and were greeted at the door by a friendly waitress who offered us a choice of a few tables. It wasn’t overly full when we arrived just before 7. The jumponit menu was a shortened version of what they normally have on offer. We were given a choice of two entrees, two mains and two desserts. I had read on urbanspoon that some people had issue with this, but I figure given that it’s a voucher meal that I don’t mind only being given limited options. It’s still a chance to give a new place a go at a fraction of the normal cost. Can’t be too upset with that. We went with the bottle of white – a Semillion Sauvignon Blanc, a fairly standard quaffer really, but it was fine. So we sipped on that while we decided what we’d have for dinner. As it turned out we went for the completely opposite menu. 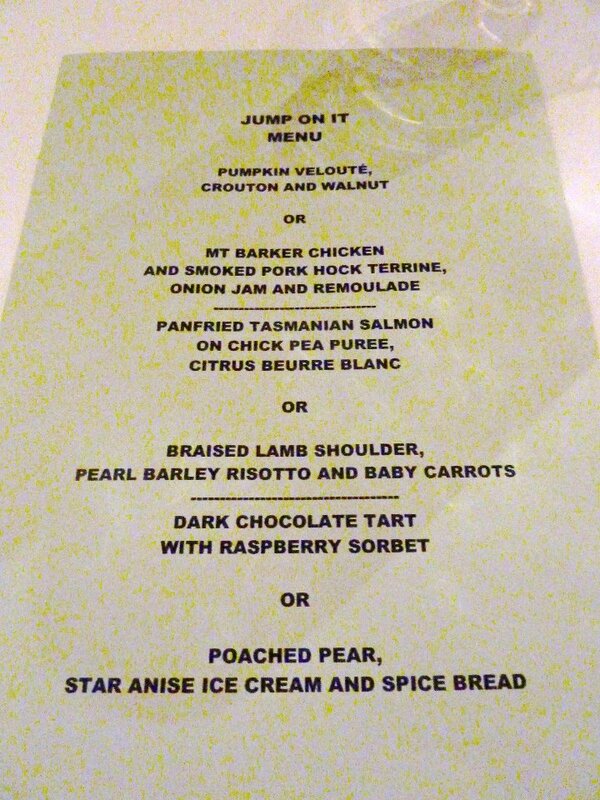 For entrees, I decided to go for the Pumpkin Veloute, GG for the terrine, then for mains I went with the lamb and GG the salmon and then pear for my man for dessert while I couldn’t go past the chocolate tart. I found the service to be very friendly and prompt. The restaurant had filled up considerably by the time our orders were in but didn’t take too long at all to be brought our first course. 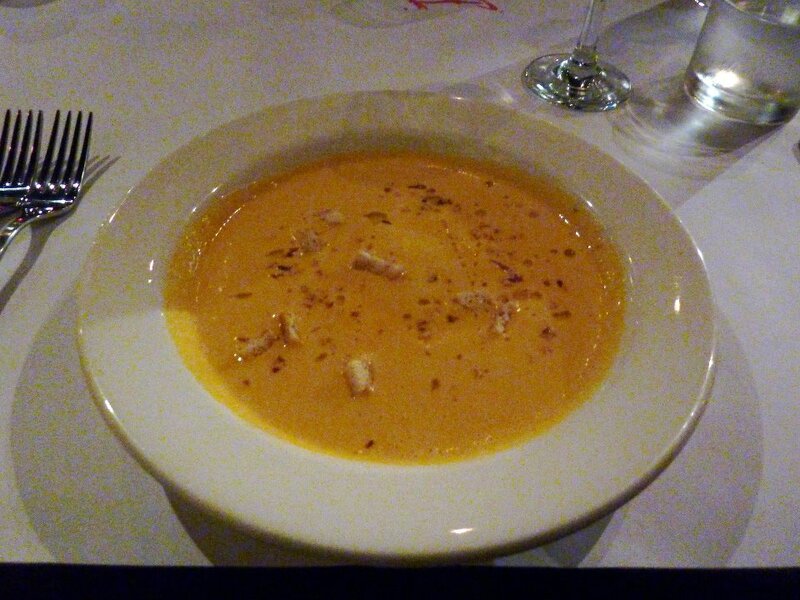 I’m not sure I knew what a veloute was at the time that I ordered it, but turns out it was a soup J I wasn’t disappointed. It was creamy and delicious and full of flavour. Really enjoyed it. Perfect for the stormy weather outside. GG also spoke highly of his terrine, which I did get to sample and it was very tasty. I’m still undecided on my feelings towards terrine but this was definitely helped push me more towards the pro-terrine camp. There was a slightly longer wait for our mains…. Not so long that we had to ask if our order had been misplaced, but just not quite as swift as round 1. No dramas though. The meals did present well when they arrived. I had thought that they (along with the entrees) were perhaps slightly on the small side, but we splashed out on a side of greens so that helped. 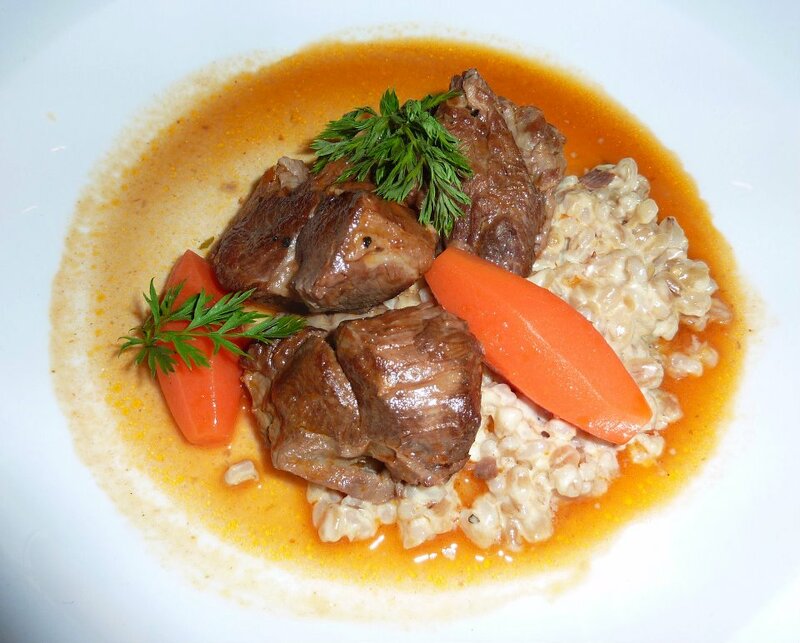 I thought the lamb in my meal was cooked perfectly and it was the first time I’d had pearl barley risotto and I thought it added an interesting texture to the meal. I also smiled at the little carrots they had with the dish. They’d had a Masterchef challenge where they had to peel carrots in that shape….. still can’t remember what that shape is called (any help here would be much appreciated J). GG also enjoyed his meal. 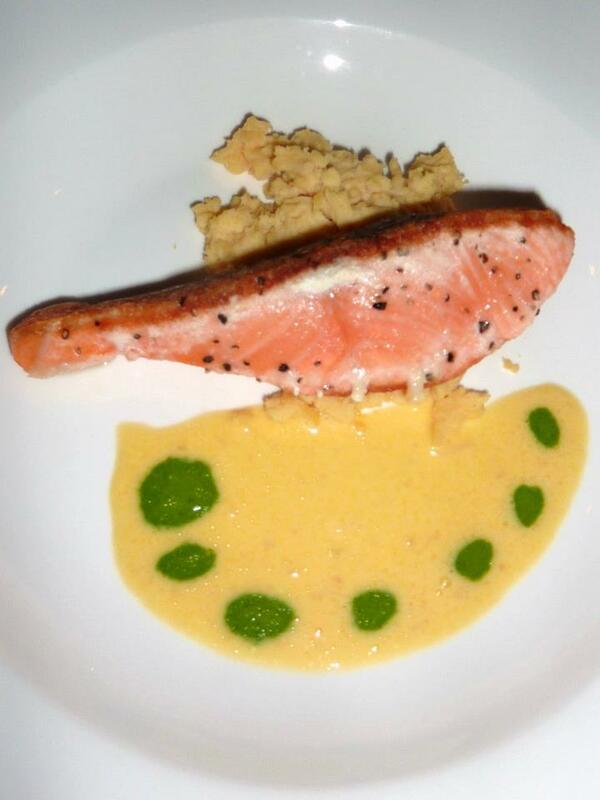 The salmon was well cooked and the accompanying sauces were as flavoursome as they were decorative. The speed picked up again and from taking our mains plates away it was only a short sojourn before dessert arrived. I thought mine looked just lovely. 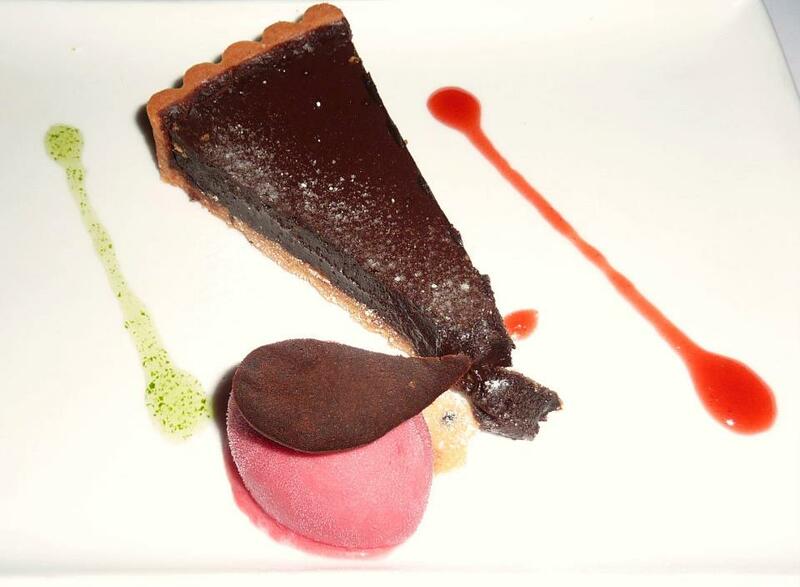 The dark chocolate tart with the pretty in pink sorbet and a few other coloured swirls was quite the rainbow. It probably wasn’t quite as rich as it looked, which wasn’t a bad thing. And the sorbet was a refreshing way to finish the dish. GG was also pleased with his pear. It definitely looked lovely perched in his bowl and served to remind me that one of these days I’m going to poach a pear! Not sure why it’s on my to do list, but it has been for a while and I should really get to it. So I’d say at the end of the three courses I felt comfortable. Definitely not bursting at the seams, but not like I was still starving. I thought the service had been really good and definitely couldn’t relate to others experience of being treated like ‘second-class citizens’ with their vouchers. Would I go back? Hmmmm I‘m not sure. Don’t get me wrong, there wasn’t anything wrong with the food, there was just nothing about it that really wow’ed me about it either. 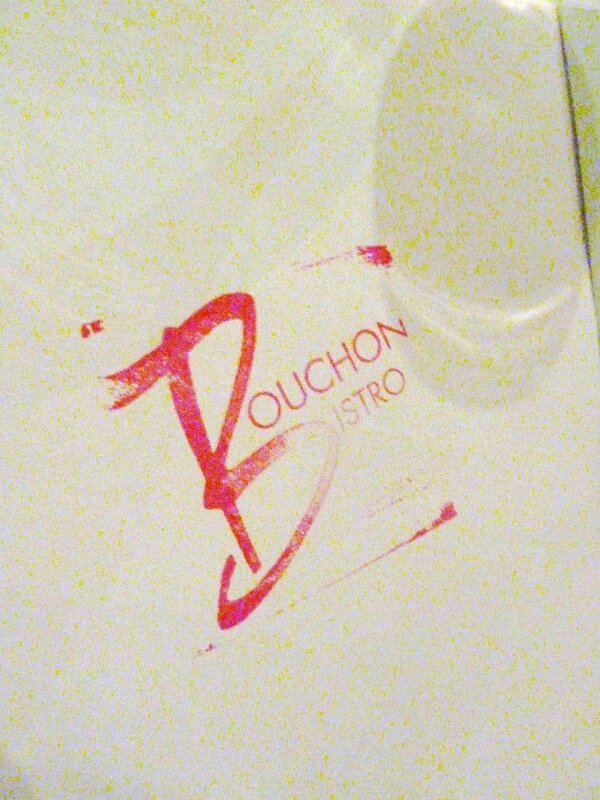 So I think it’s more that I wouldn’t go out of my way to go again, but if I was ever in the area and in need of a decent meal then I know that Bouchon Bistro would be a decent spot to re-visit. I haven’t been there in a while but this is my favourite restaurant in perth. I can understand your reservations in regards to the menu. It looks like with the menu they held back a lot in regards to what they normally serve. I just had a quick google and their usual menu is a lot more inventive having things like “Panfried Scallops, Shaved melon, Radish, Onion sprouts, Verjus dressing, Celery Mousse” on there. Sounds like I’ll definitely have to venture back then and give it another go then! Some of those things you mentioned do sound delish! Hi In response to “They’d had a Masterchef challenge where they had to peel carrots in that shape….. still can’t remember what that shape is called (any help here would be much appreciated J). ” – they called turned vegetables.